If a padlock's key is lost, calling a locksmith out to make a new key is usually cost prohibitive; replacing the key will almost always cost more than the lock is worth. Designed specifically to guard against having the shackle cut, shielded padlocks are constructed with a guard plate, or "shield," surrounding the top of lock. Where the shackles of most unshielded padlocks are easily defeated with a saw or bolt cutters, cutting a shielded padlock requires a different approach. 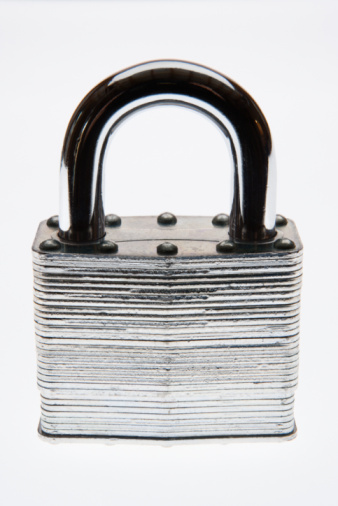 Shielded padlocks cannot be cut with conventional methods. Drill a pilot hole into the center of the keyhole slot on the bottom of padlock with a 1/8-inch drill bit. Cut through the lock's tumblers. Insert the tip of a 1/2-inch drill bit into the pilot hole. Drill into the lock cylinder at slow speed until the bit has cut 1/2 inch into the lock. Look inside the cylinder for a slot running across the top of the width of the keyhole. If the slot is not visible, continue drilling into the keyhole, with the 1/2-inch bit, in 1/8-inch increments until the slot becomes visible. Open the lock. Insert the tip of a flat-head screwdriver into the slot in the lock cylinder and turn the handle of the screwdriver.